Receiving first place from the Pennsylvania Athletic Trainers’ Society (PATS) in its Student Public Relations competition was simply icing on the cake for Neumann University students Ashley Girard and Stephen Smith. The real highlight for these two senior athletic training majors was the work that got them the award. The contest was part of National Athletic Training Month this past March. The PATS Public Relations Committee hosted the student public relations contest, the theme of which was “Compassionate Care for All.” The top prize was $500. 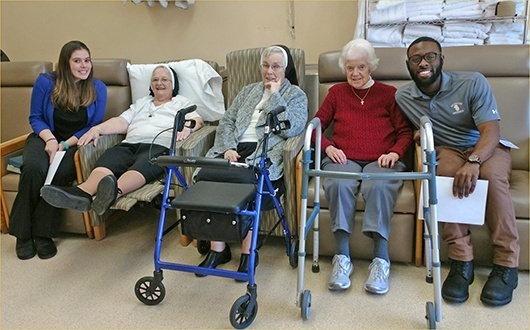 Girard and Smith volunteered at the Assisi House, the retirement convent for the Sisters of St. Francis of Philadelphia, located across the street from Neumann University. During the month of March, they assisted in physical therapy sessions with the sisters and taught a balance class. “We worked with the physical therapist and she let us run the entire hour-long balance class. It was a lot of fun and the sisters were so great,” Girard said. Smith was the first of the two to start volunteering at the Assisi House. He had a desire to help people and would assist the sisters walking around the complex. “I knew I wanted to work with the geriatric population because I had my grandmother in the back of my mind,” Smith explained. “When I first got there I was a little nervous. I wasn’t sure what was expected of me,” he added. Girard recently became a Catholic through Neumann University’s RCIA (Rite of Christian Initiation of Adults) program. She looked at her work at the Assisi House as a way to give back to the sisters that supported her during her RCIA process. “I thought giving back to them would be nice, and it was a great experience. They were funny, enthusiastic and they loved to chat!” she said. Girard and Smith were first alerted to the contest by their teacher, Dr. Andrea Lobacz, assistant professor of athletic training. She thought Neumann’s athletic training program students would have a good shot at winning. “I found out about the contest via social media (twitter) and when I read it, I knew that students from our program would put together a solid submission. I passed along the information to Ashley. We brainstormed some ideas, to be sure that we were addressing the goals and motto of the campaign, and Ashley pushed ahead with Stephen to produce the photo and write up the description of the campaign/photo that had to be submitted,” Lobacz explained. Both Girard and Smith agreed that working with the retired sisters was the highlight of their last semester at Neumann University. “The best part was taking the time to get to know some of the sisters. They have a lot of interesting life stories and were very funny. They made it a comfortable environment for me,” Smith said.